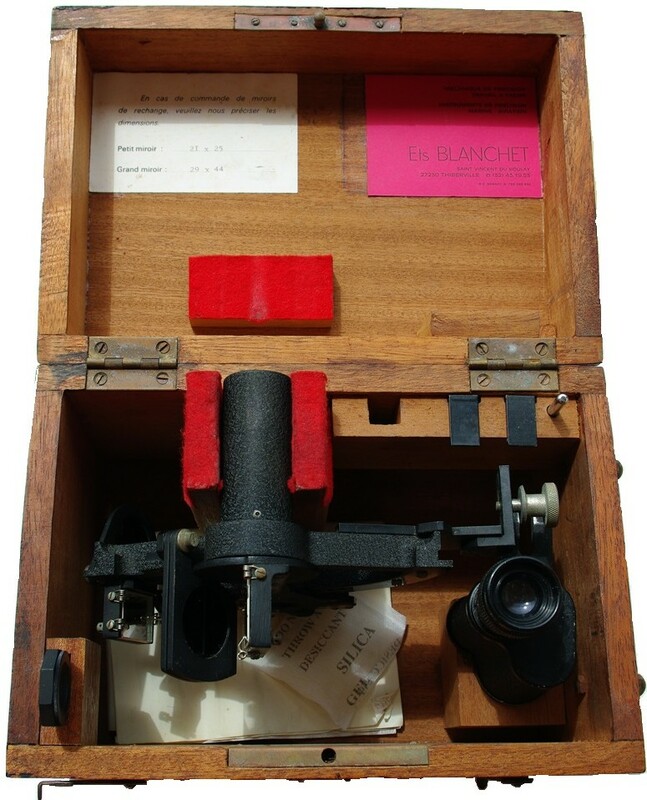 Figure 1: Sextant in its case. 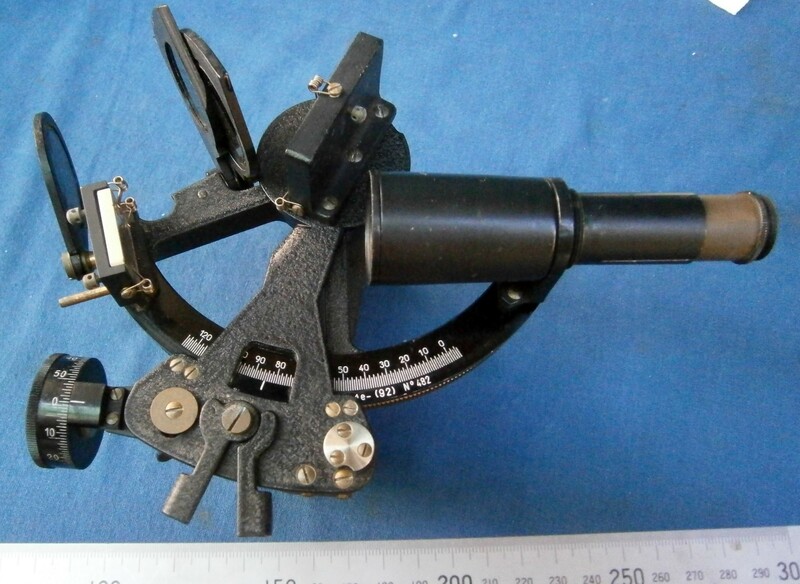 I recently acquired for a relatively modest sum the three-circle vernier sextant shown in Figure 1. Attached at the front corner of the frame is a plate engraved with the letters “S.H.” or “Service Hydrographique (de la Marine)” or French Naval Hydrographical Service, formed in 1886 as successor to the “Dépôt des cartes et plans de la Marine”, founded in 1720. The plate seems to serve no other purpose that I can think of than as an identifier. Figure 2: Front of the tangent screw mechanism. Engraved on the front of the tangent screw mechanism is the name “E. Bouty”. Edmond Bouty (1845 – 1922) was a physicist in the Science Faculty at Paris, but I cannot find that he was an instrument maker, nor is there any other name on the sextant. It may be that his contribution was the design of the scale lighting system, about which more later. It is not even clear that the sextant is of French manufacture, as at the left end of the limb are the letters “D.S.” indicating Deutsche Seewarte, the German Hydrographical Service, but the frame, of about 180 mm radius, differs in detail from that of C Plath’s Dreikreis sextant. Figure 3: Turning marks on front of frame. The bronze frame is of no particular interest except that when clearing old and perished paint from the frame during restoration I noticed marks (Figure 3) that showed that it had been faced in a lathe, giving a small clue to the manufacturing process. Figure 4: Spring box detail. 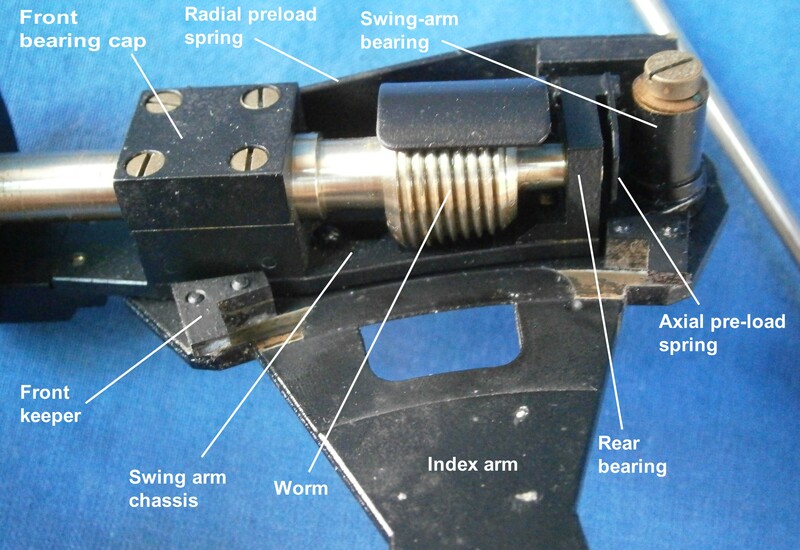 Returning to the tangent screw mechanism, the spring box is shown exploded in Figure 4. A tongue on the sliding block is trapped between the end of the tangent screw and a long spring mounted on a guide and retained by a nut. The end of the guide can be seen on the right of Figure 2. Figure 5: Exploded view of index arm clamp. 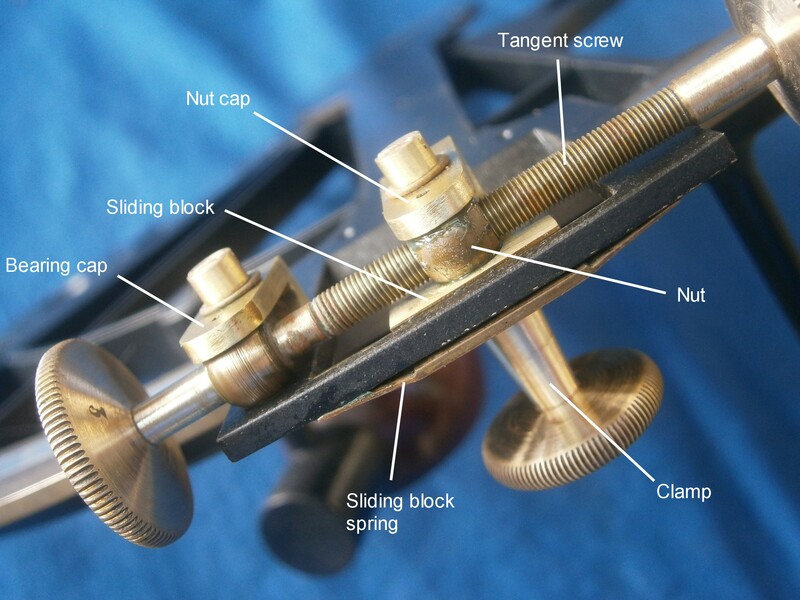 The sliding block is retained in its slide in the lower end of the index arm by the retaining spring on the upper right of Figure 5, while the clamp screw and its leaf spring bears on the back of the limb. In use, the clamp is slackened and the index arm moved approximately into position, when the clamp is tightened, thus fixing the sliding block to the limb. Turning the tangent screw thus moves the index arm about the sliding block against the pre-load of the helical spring as a means of fine adjustment. 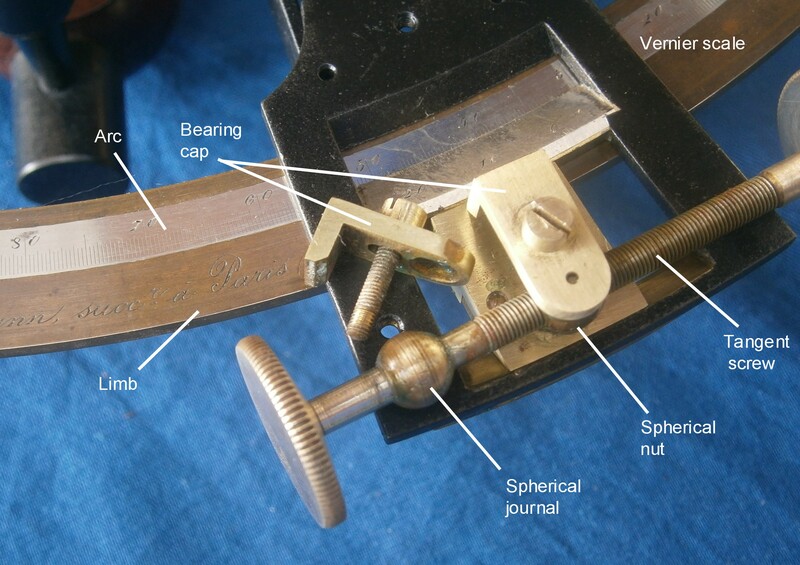 In truth, it is the index arm that slides rather than the sliding block, but as no one else had given it a name, I decided to do so when writing “The Nautical Sextant.” This system of applying pre-load was used in many vernier instruments such as vernier theodolites and gun aiming systems. as well as in several makes of sextant. Figure 6: Index mirror bracket. The index mirror is held against a vertical bracket by means of a clip which is tightened against the bracket by means of a screw bearing on the back of the bracket. The mirror is made perpendicular to the arc of the sextant by a system that seems to have been used only by French makers. Two screws attach the radiused feet of the bracket to the upper end of the index arm and the end of a screw held captive in the base of the bracket can then rock the bracket to bring the mirror square to the plane of the arc.. Figure 7: Horizon mirror bracket. 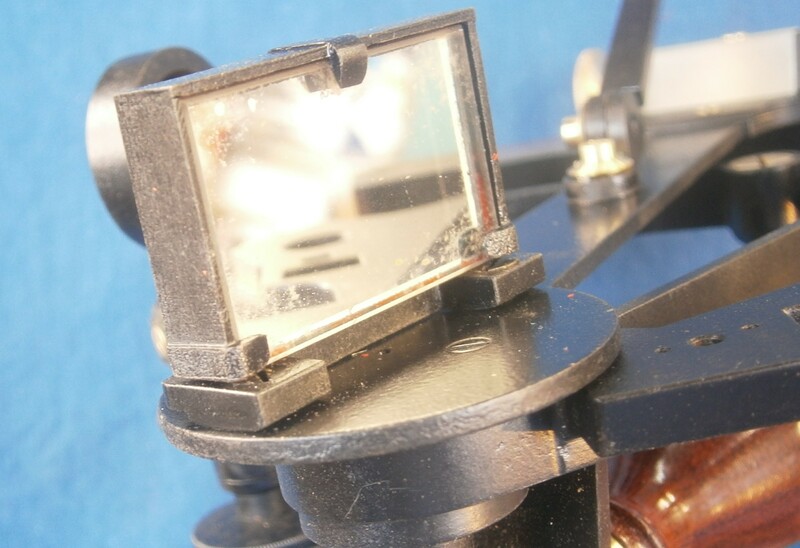 Figure 7 shows a somewhat similar method of adjusting out side error of the horizon mirror, but in this case a deep slot cut nearly through the base of the bracket gives flexibility to the the adjustment by means of another captive screw. Figure 8: Horizon mirror detail. 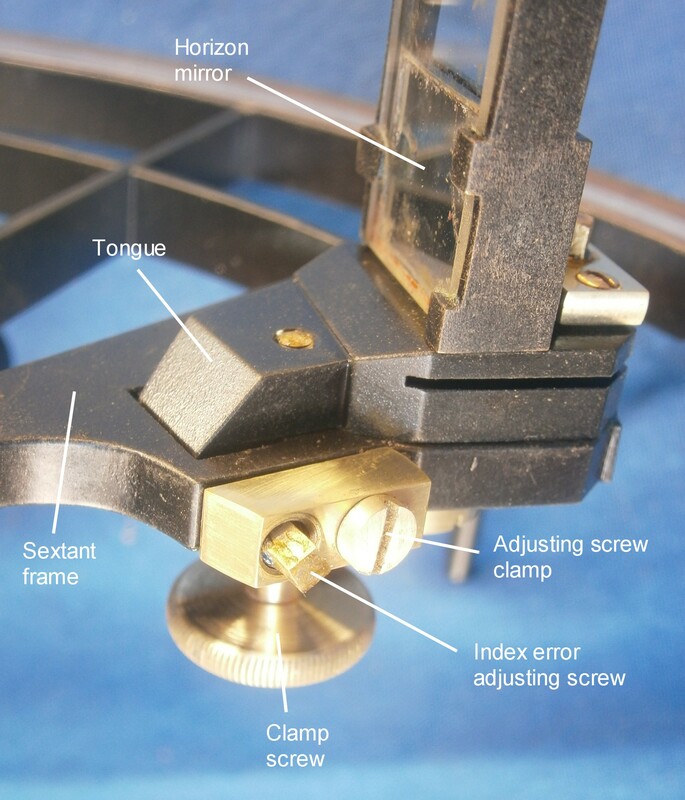 The detail shown in Figure 8, as well as making clearer how the mirrors are held against their brackets, shows that the horizon mirror bracket can be adjustably rotated about an axis vertical to the plane of the sextant, in order to adjust out index error. Note that the mirror is fully silvered, which means that the direct view of the horizon does not pass through glass and that the edge of the silvering of the mirror can be given better protection against corrosion. It does however result in a smaller area of overlap of the direct image of the horizon and the reflected image of the observed body when using a Galilean telescope. Enter “Freiberger yacht sextant” in the search box at the top of the page for a discussion of why this is so. Figure 9: Detail of index error adjustment. Figure 9 gives more detail on the index error adjustment. There is a boss as an axis on the underside of the horizon mirror bracket that passes through the frame and is held by a retaining screw. A further boss passes through a clearance hole in the frame and has an internal thread tapped in it as a nut. 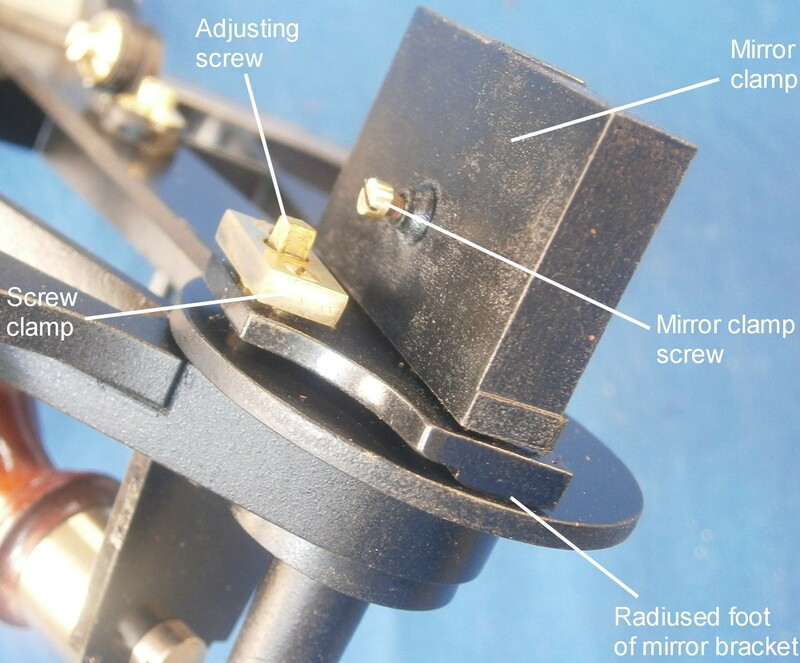 The index error adjusting screw, held captive in the frame by a screw and clamp, engages with the “nut”, so that when the adjusting screw is turned, the whole mirror bracket rotates. When adjustment is complete, the bracket is locked in place by a clamp screw.. This is a rather complex means of adjustment of the horizon mirror, which had long been achieved much more simply by means of a pair of screws bearing against the back of the mirror, while lugs on the mirror clamp provided spring loading. Elegant though it may have seemed to its (?) French inventor, it is unnecessarily complex., though perhaps no more complex than the solution adopted by Brandis and its US successors. Figure 10: Interior of battery handle. This sextant represents perhaps one of the earliest ones to light the scale in poor light. Scale lighting had to wait for the development of suitable dry batteries in the 1890s and of miniature flashlight bulbs with robust tungsten filaments in about 1904. 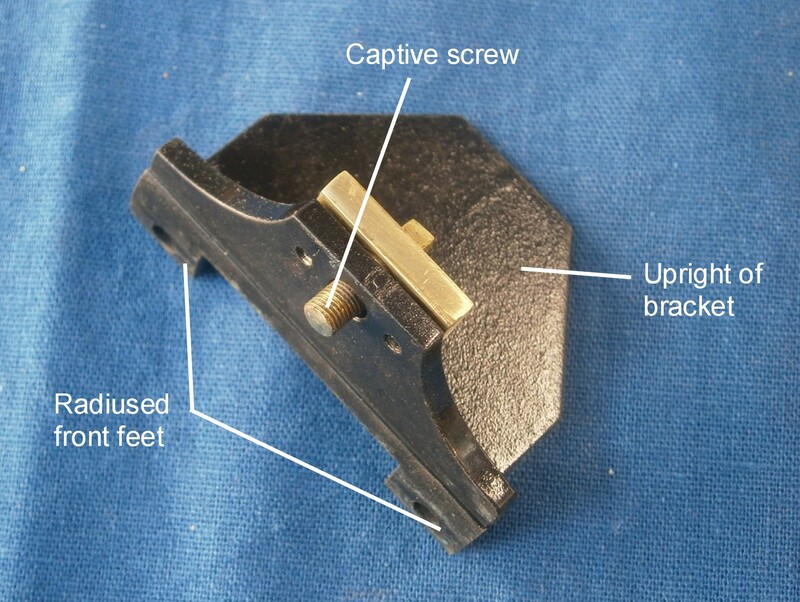 Figure 9 shows the interior of the Bakelite handle which accepts a 3 volt 2R10 battery. 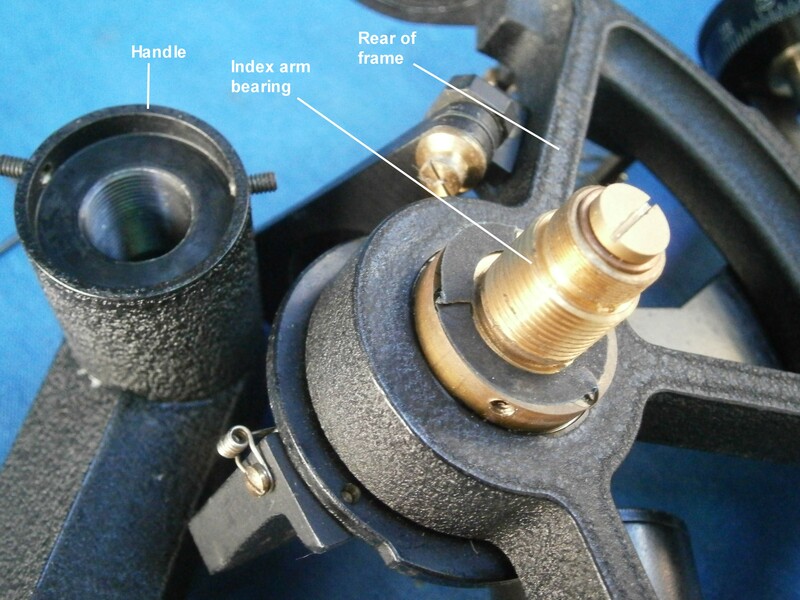 A screw at the lower end holds the negative pole of the battery firmly in electrical contact with the frame of the sextant and at the upper end a spring loaded switch plunger makes contact with the positive pole. The top end of the lid is bevelled and the lid itself is slightly bowed, so that when rotated closed it remains in place. Figure 11: Wire from handle to foot. A wire passes from the body of the switch to the foot (Figure 11), inside which is a spring loaded brass plunger (Figure 12). Figure 12: Inside of foot. The index arm journal is hollow and a wire passes up its centre to an insulated contact on the end, to make electrical contact with the contact inside the foot (Figure 13). Figure 13: Insulated index arm contact. The other end of the insulated wire passes down the index arm in a machined groove to a clip held on an insulator block (Figure 14). Figure 14: Lighting bulb holder. The clip makes contact with the outside of the bulb holder and thence to the central contact on the bulb. The outside of the holder is insulated from the brass interior, which is threaded for the bulb. The brass interior fits snugly in the cylindrical shade which is attached to the index arm and hence the frame, thus completing the electrical circuit. Most subsequent makers contented themselves with a simple loop of insulated wire to conduct electricity to the bulb, but this more complex and no doubt more expensive system has the merit of not flexing any wire. Like most complex systems, however, there is more to go wrong. 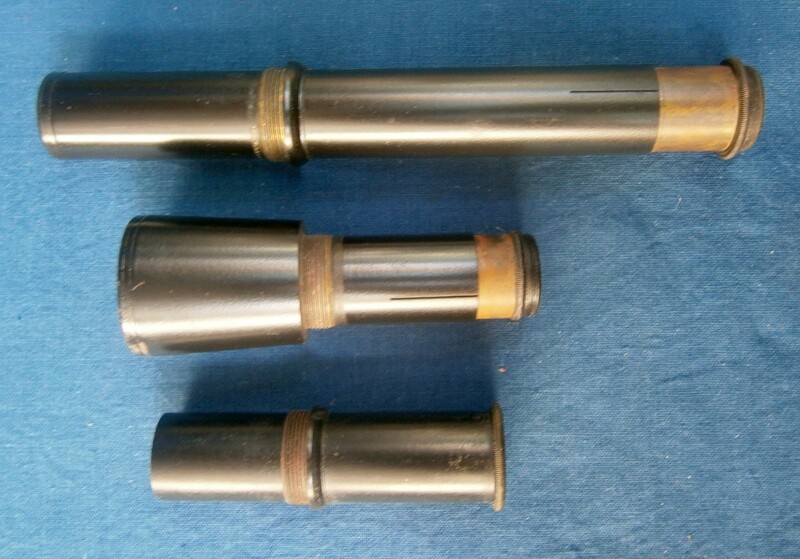 The telescope rising piece (Figure 15) is simpler than that of many of its early 20th century competitors and it has a rectangular mortice machined in its face to engage closely with a tenon on the telescope bracket, so that it can be slid up or down to vary the amount of light from the horizon entering the telescope. 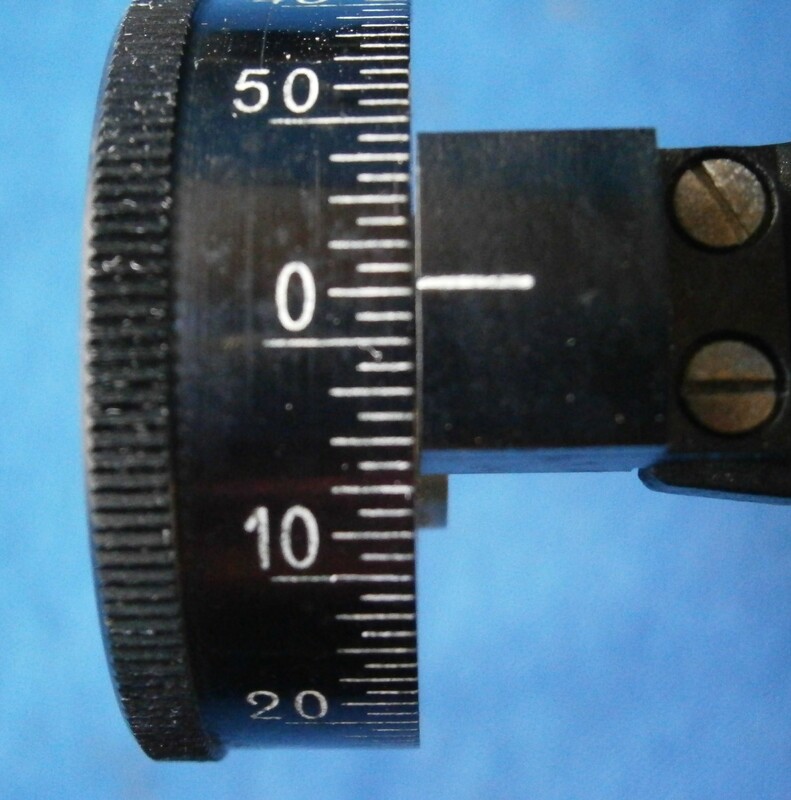 Collimation is standard, by means of a tilting telescope ring held in place by two screws. The shades make none of the usual provisions to prevent movement of one being transmitted to its neighbours. Resistance to rotation is given by means of a Belleville washer, a conical washer with the characteristics of a short, stiff spring. Since these date from about 1870, they add no clues to the age of this sextant. The kit of telescopes shown in Figure 16 is for the most part standard, with a 4 x 24 mm Galilean “star” telescope for general use and a 6 x 16mm Keplerian “inverting” telescope. 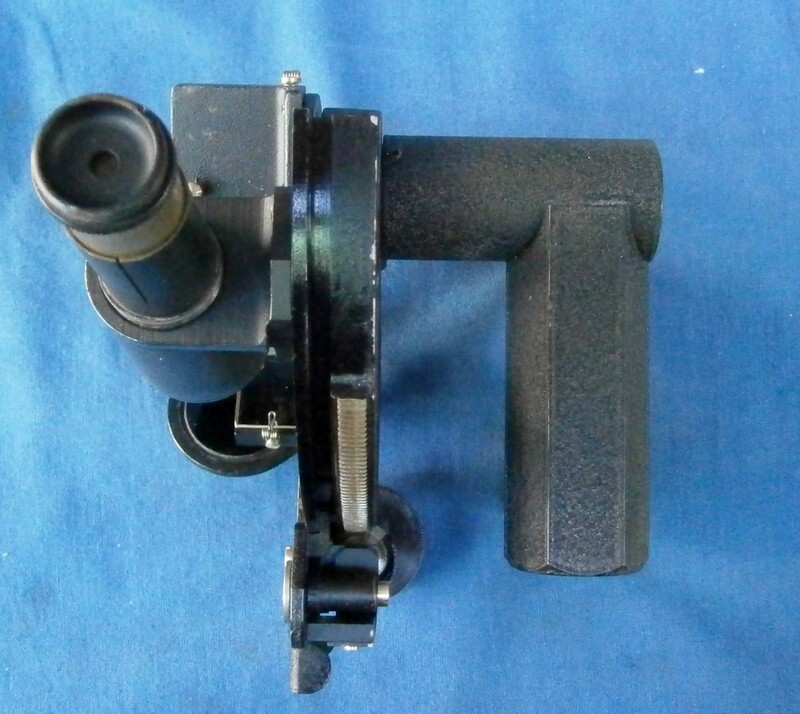 By the twentieth century, this latter probably received little use except for artificial horizon sights to rate chronometers in out-of-the-way places of known longitude. The large 3 x 36mm Keplerian telescope is of interest as it has a wide angle eyepiece with an eye lens of 25 mm aperture. This gives an image nearly as bright as the 4 x 24mm telescope (the extra lens in the eyepiece causes some loss of light) and with a field of view about four to five times wider. The mahogany case was much battered and stained, and with several shrinkage cracks, so it was gratifying to be able to restore it to the state shown in Figure 17. It looks decidedly English and placing the handle on the side follows Henry Hughes and Son’s practice, but neither the sextant frame nor the mirror mountings are consistent with this. If you enjoyed reading about this sextant, you may also enjoy reading my “The Mariner’s Chronometer“, also available via Amazon.com. Figures may be enlarged by right clicking on them. Return to the text by using the back arrow. 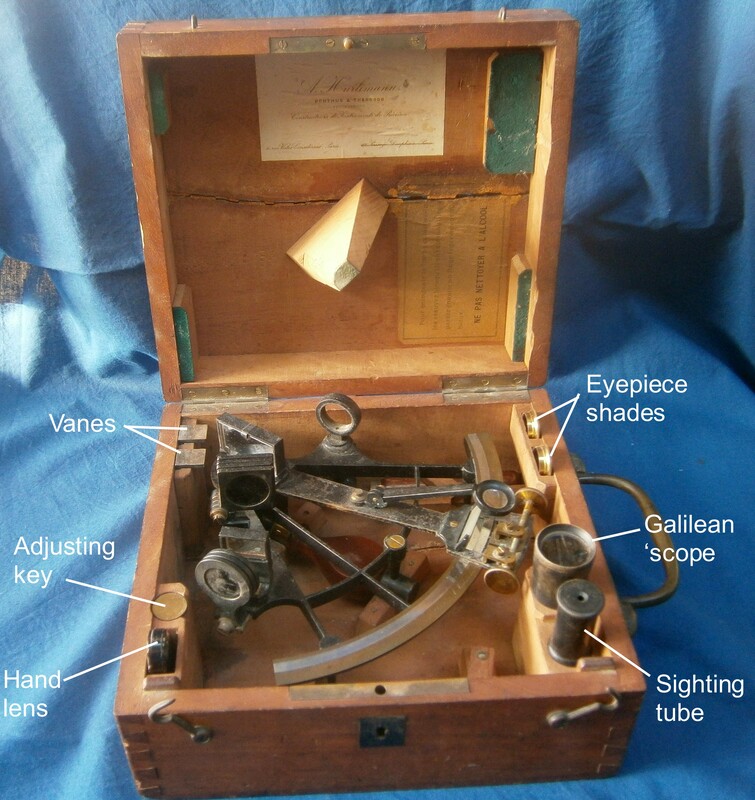 A rather dusty and neglected little French sextant came into my hands a few weeks ago. The kinship of French sextants is quite difficult to sort out. This one bore a label in which the name of A Hurlimann is given prominence and the names of his successors, Ponthus and Therode, are given less prominence (Figure 1). The limb is engraved in copperplate Lorieux, A Hurlimann, succr (successor) à Paris. Figure 1 : Label in lid of case. 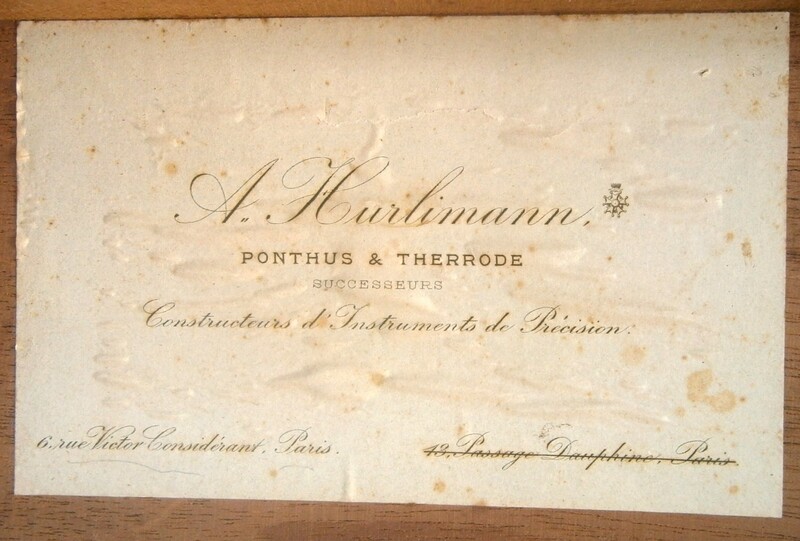 A. Hurlimann succeeded a distinguished line of French instrument makers. Two pupils of the renowned Henri Gambey founded a firm in 1845. Possibly both originally named Schwartz (Black), they were known as Lenoir (Black) and Lorieux, and managed by Lorieux and then Hurlimann. In 1900 they were succeeded by Ponthus and Therode. At the turn of the century in about 1902 the firm moved from 43, Passage Dauphine, Paris, to 6 rue Victor Considerant. It was then taken over by Albert Lepetit , possibly in 1914, and moved to Montrouge at 204 avenue Marx Dormoy, eventually passing into the hands of Roger Poulin in about 1950. Thus, I surmise that the sextant dates from between 1902 and 1914. Figure 2 shows the instrument in its case as received. There is a large shrinkage crack in the lid and floor. Not clearly visible are a Keplerian telescope of about 6 power in a pocket at the front of the case and a screwdriver at the back. The label in the lid counsels against using alcohol to clean the instrument, suggesting that it is painted with a shellac-based lacquer (which dissolves in alcohol). 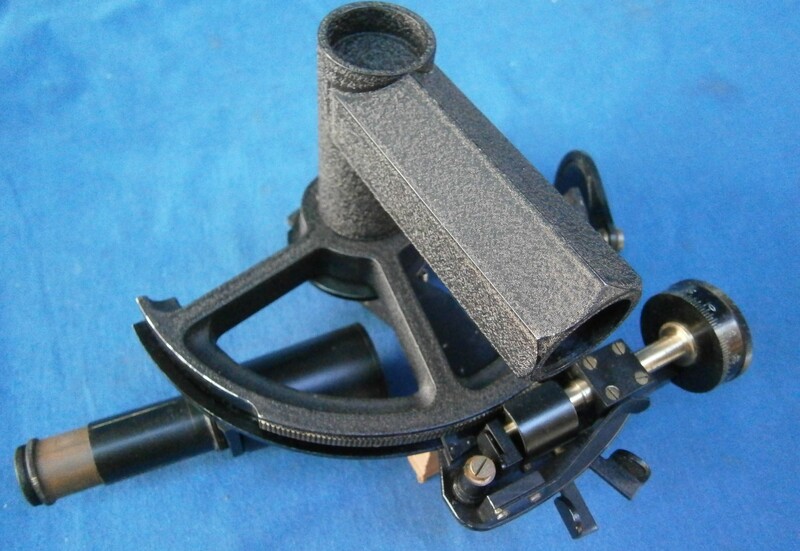 Figure 2: Sextant as received. The frame is a bronze casting with inlaid silver arc, beautifully finished and otherwise unremarkable except for its relatively small radius for the time, of only 142 mm. The arc is divided to 20 minutes and the vernier reads to a realistic 30 seconds. The divisions are crisp and the numerals are hand engraved in italics. A more usual radius for vernier sextants is about 180 mm and many of these instruments have verniers divided to 10 seconds, though it is usually quite impossible in these cases to say with certainty which pair of lines coincide. There are two main areas of interest in the design: a) the mirror adjustments are complicated, compared to what we may think of as the modern method of springs on the front of the mirrors opposing the action of screws behind the mirror (in fact this dates from the 18th century and was invented by John Dolland); and b) the mode of mounting of the tangent screw, which seems to have had a German influence, as it is also seen in vernier sextants made by Frederick Ernest Brandis, a German immigrant to the New York in 1858. The index mirror is held against the upright of a bracket by means of a clamp whose clamping screw bears against the back of the upright as shown in Figure 3 and Figure 4. Figure 3: Front of index mirror clamp. Figure 4: Index mirror in place. The mirror is adjusted for perpendicularity by rocking the whole bracket on the two radiused front feet by means of an adjusting screw held captive in the horizontal part of the bracket and engaging with a threaded hole in the top of the index arm (Figure 5). 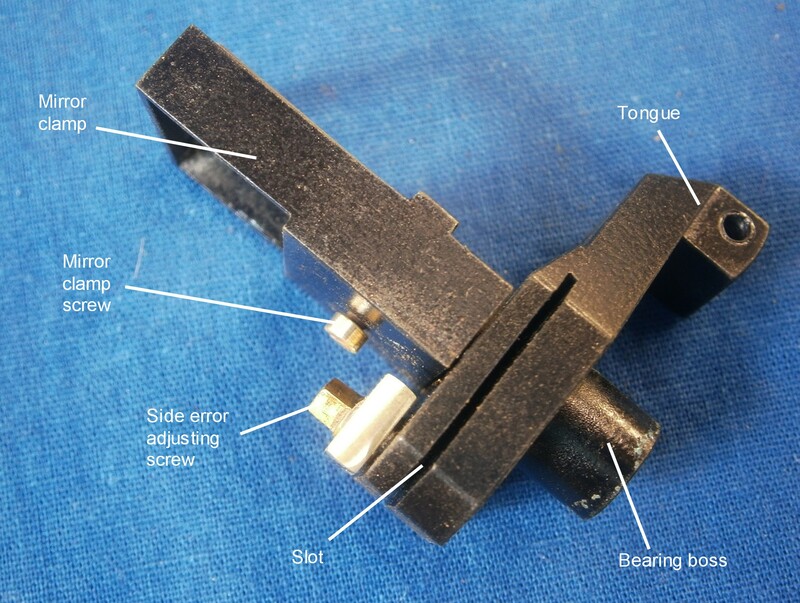 The screw can be locked by tightening the screws that pass through the brass clamp bar that holds the screw captive. An earlier (and simpler) method was to have the hole in the foot tapped for a screw, the end of which simply bore on the face of the index arm, though there was a tendency for the thread to strip in clumsy hands. Figure 5: Index mirror bracket with screw in place. The horizon mirror adjustment system is even more complex. A large cylindrical boss on the underside of the bracket (Figure 6) passes through a hole in the sextant frame and is secured by a large brass locking screw and washer (Figure 7). A screw held captive in the frame enters the threaded hole in the tongue and rotates the mirror to correct for index error (Figure 8). This movement is locked by means of the knurled clamp screw behind the frame, seen in Figures 7 and 8. Figure 6: Horizon mirror bracket and clamp. Figure 7: Horizon mirror locking screws. Side error is taken care of by a similar captive screw that opens or closes the slot in the base of the bracket, as seen in Figure 6 and 8. These adjustments are easy to use and effective, but are at the expense of a good deal of complication. Figure 8: General view of horizon mirror adjustments. The telescope mounting again achieves a good result at the expense of complexity (Figure 9). The rising piece is triangular in section and is close-fitting in a triangular hole in a bracket that passes through a hole in the telescope frame and which is secured by a large knurled nut. A countersunk screw passes through the frame into the bracket to secure it against rotation. A large knurled adjusting thumb screw is held captive in the bracket and its thread passes up the middle of the rising piece to make it rise or fall. 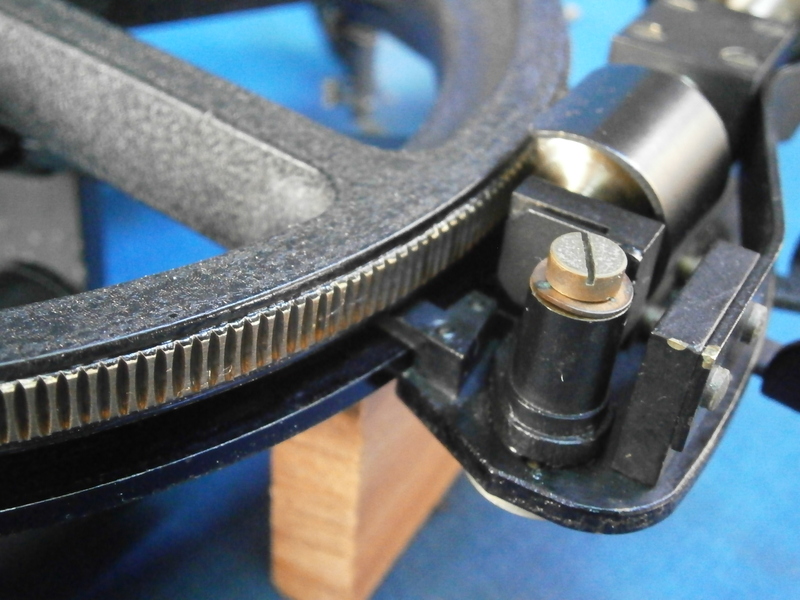 Figure 9: Mounting of telescope rising piece. Figure 10 shows the mounting exploded. Figure 10: Exploded view of telescope mounting. The tangent screw follows F E Brandis’ practice quite closely (or vice-versa). 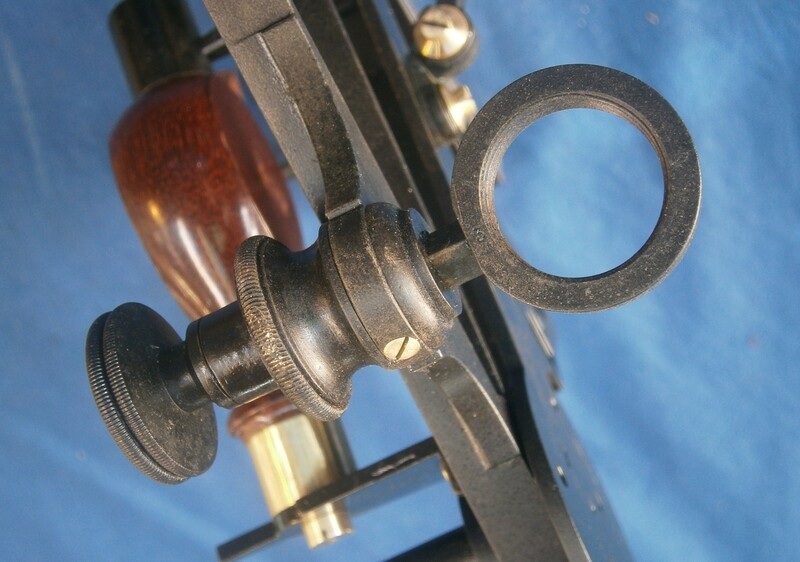 It has a knurled knob on each end and runs in a spherical bearing at the front end. The threaded part passes through a spherical nut which is held captive in the sliding block by a cap and prevented from rotating by the slender boss on its underside, that passes into a hole in the spherical seat on the face of the sliding block (Figure 11). Figure 11: General view of tangent screw mechanism. 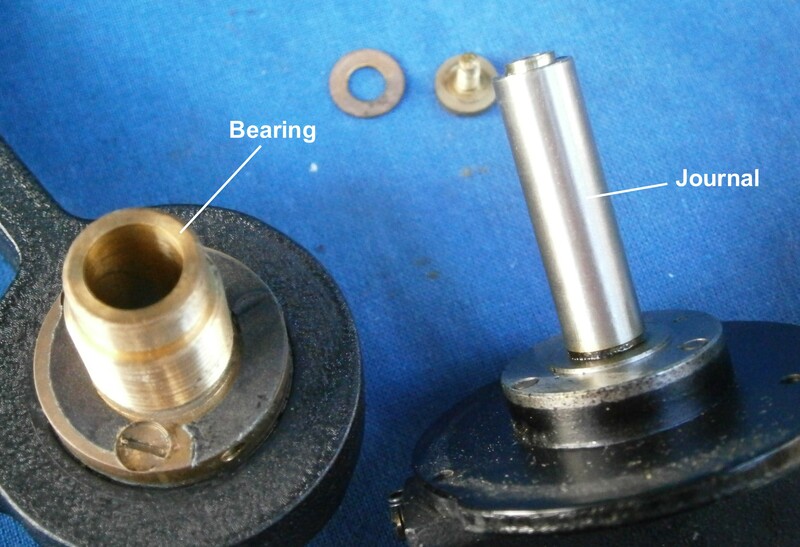 Figure 11 shows the tangent screw bearing exploded and it can also be seen that the nut cap is a similar device to the bearing cap. Figure 12: Tangent screw bearing. The sliding block is held in the rectangular window cut into the expanded part of the index arm by a leaf spring and a clamp spring. When the clamp is tightened, the block can no longer slide over the limb, so that when the tangent screw is rotated it is the index arm that moves. Thus, although I have named the part the sliding block (since no one else seems to have troubled to give it a name) in truth it is the index arm expansion that does the sliding. Figure 13: Underside of sliding block and clamp. The shades mountings are unremarkable in design (see Figure 7) except that they have no provision for isolating the movement of one shade from the next by means of, for example, keyed separating washers. Friction is provided by Belleville washers, patented in 1867 by Julien Belleville, a Frenchman. The telescope kit comprises the usual “zero magnification” sighting tube, a 3 x 26 mm Galilean “star” and a 6 x 15 Keplerian or “inverting” telescope (Figure 14), supplemented by two eyepiece shades of more or less equal density though of slightly different colours (neutral and deep orange). 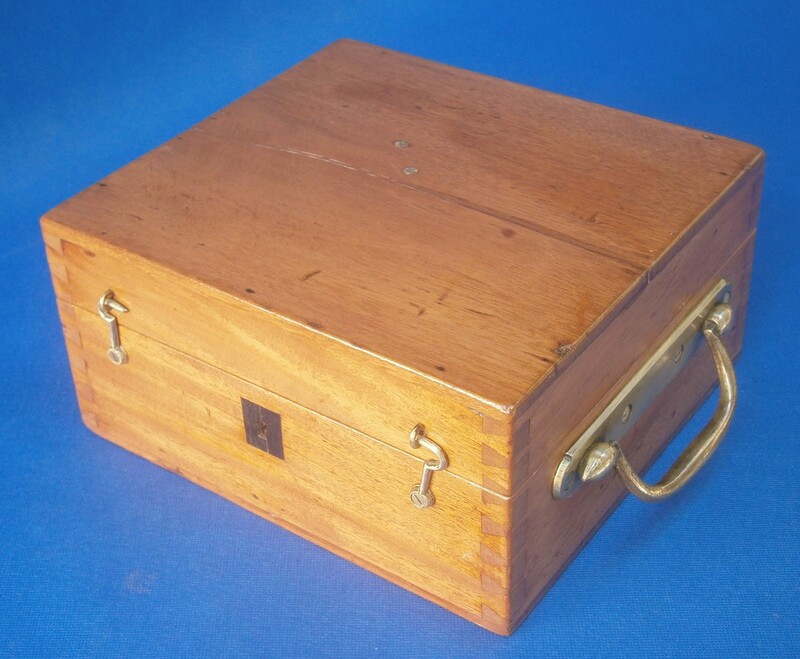 The case (Figure 15) is of a light coloured wood with a grain similar to that of mahogany, with dovetailed corners, and both top and bottom were glued and nailed on with steel pins. I find it strange that a few francs were saved by using steel instead of brass pins or, better, brass screws, given that the whole instrument probably cost several months salary for a merchant officer of the time. On the other hand, the brass handle seems on the heavy side for the neat little case into which all the parts fit snugly, perhaps too snugly, and the instrument is held in a pair of felt-lined pockets by a pillar in the lid which passes through the frame and sits on the sextant handle (Figure 2, above). The latter is of the traditional pear shape. The hinges and hooks are of brass and there is a brass lock with ebony escutcheon. It was possible to remove both top and bottom for re-gluing and the crack in the bottom was simply closed up, leaving a minor cosmetic deficit at the back of the case. The crack in the top was much wider and I dealt with it after re-gluing and nailing by filling it with epoxy cement and adding a layer of coloured filler above and below. It was not possible to save the label with its cleaning advice and I replaced it by a modern one using a matching typeface and lay out. Figure 16 shows the final result of the restoration of sextant and case. Figure 16: Restored instrument and case. Post script: Come to think of it, the card pasted inside the lid, suggests a time of sale after 1902, but the inscription on the limb of the sextant itself suggests that it was made before the Pontus and Therode take-over. A few months ago, I acquired an unusual little sextant, but was only recently able to collect it in Europe and bring it home to New Zealand for cleaning and overhaul. According to the seller, it had been found in the attic of a merchant seaman who had been active in the 1950’s, but there was no other information about its origins. It bears the name “Lefebvre-Poulin, Montrouge, but the naming of French sextants is rather confusing. Poulin made sextants in the second half of the 20th century in Montrouge in the south-west suburbs of Paris, but Jules Lefbvre was active in central Paris in the latter half of the nineteenth century, so it is unlikely that there was an association between the two makers, and the name of Poulin is sometimes associated with Blanchet. Apart from its small size, there are one or two other unusual features such as its handle and its micrometer drum, which spans two degrees. Figure 1 shows a front view of the un-restored instrument and Figure 2 gives a rear view. You can get a magnified view of all figures by clicking on them. Return to normal by using the back arrow. Figure 1: General arrangement, front view. Figure 2: General arrangement, rear view. 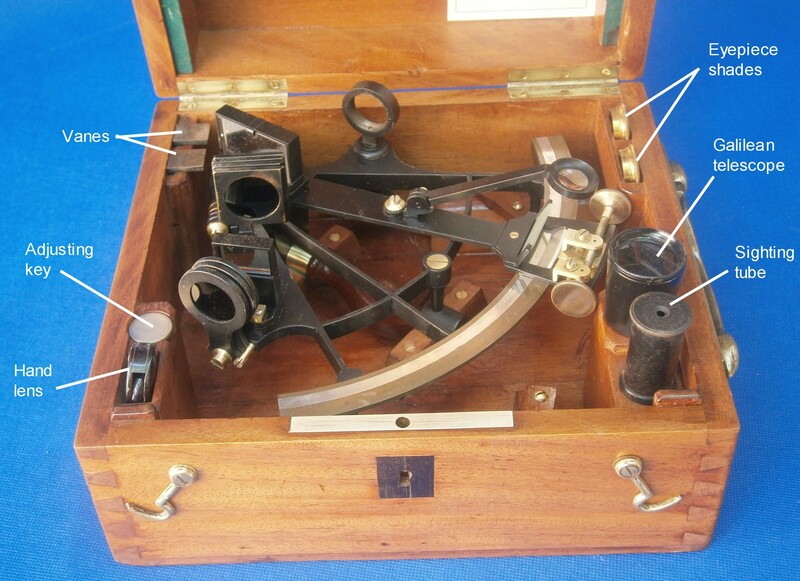 To help readers who have not yet had the wisdom to buy my book, “The Nautical Sextant“, in Figure 3 I show the restored sextant with its main parts labelled. 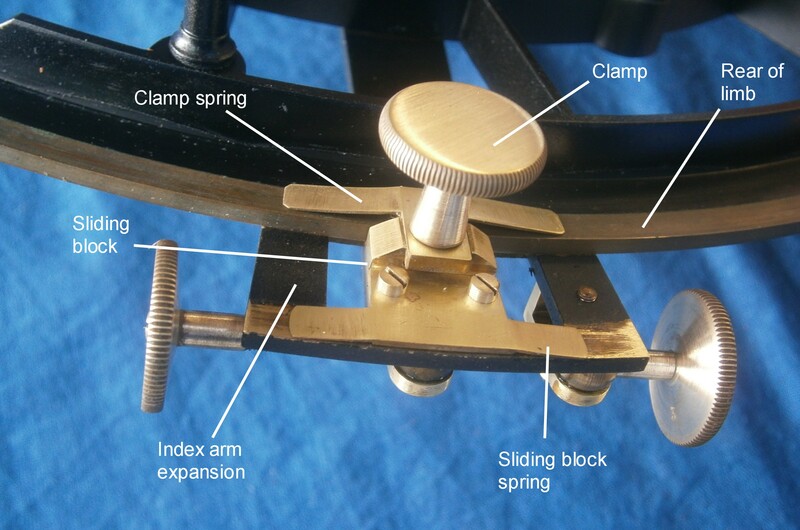 Figure 3: Main parts of the sextant. At the heart of any sextant is the frame and its bearing for the index arm. In this case, the frame is of an aluminium alloy with a cast-in bronze rack for the micrometer and a bronze bearing for the index arm. The latter also serves as a point of attachment for the unusual handle (Figure 4). Figure 4: To show handle. The hexagonal alloy handle screws over the index arm bearing (Figure 5) and is locked in place by two Allen grub screws. The bearing itself is attached to the frame by three brass screws. Figure 5: Index arm bearing, and handle attachment. The vast majority of sextants ever made had tapered index arm bearings, but as micro-finishing of plain parallel bearings advanced in the second half of the twentieth century, C Plath and Observator made use of the new technology in their sextants. As Figure 6 shows, Poulin followed suit in this sextant. The parallel steel journal rotates in the bronze bearing (strictly speaking, the bearing is the enclosure in which the shaft or journal rotates), and is secured against axial movement with a phosphor-bronze spring washer and a brass screw. No provision is made for adjustment as no wear is to be expected in the slow-moving, lightly-loaded bearing. Figure 6: Exploded index arm bearing. 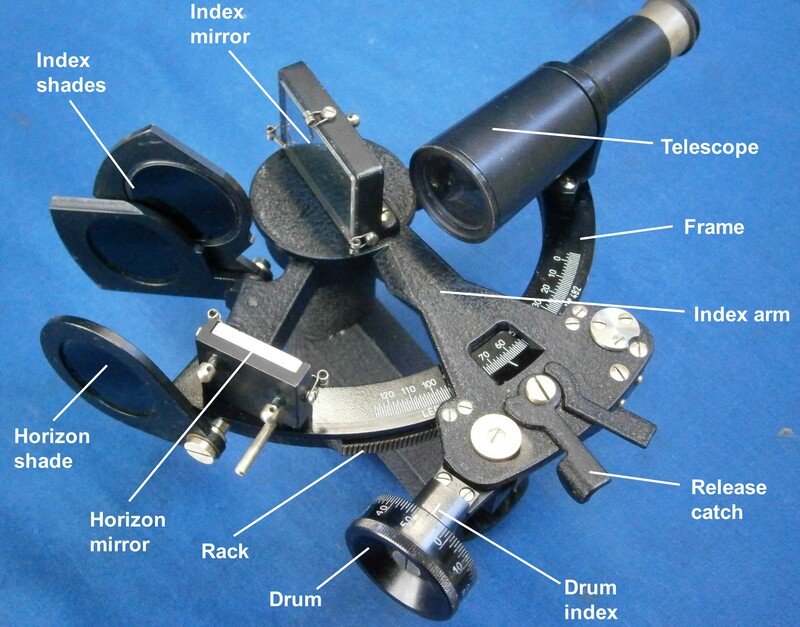 Figure 7 shows the rack with a view of the micrometer mechanism. 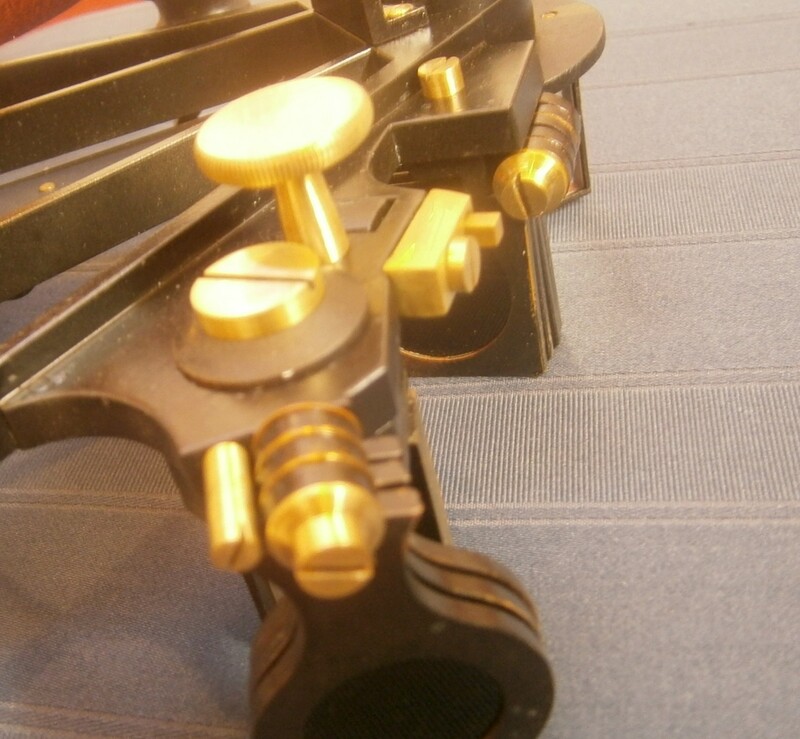 The bronze rack appears to be cast in to the frame and its pitch is relatively large for its radius of about 80 mm, so that one turn of the micrometer worm advances the sextant reading through two degrees. Henry Hughes and Son in their WWII half-size seaplane sextant reduced the pitch of the rack so that they could use most of the components of the full-sized micrometer mechanism, needing to modify only the pitch of the worm to match the rack. Their micrometer advances the sextant reading through one degrees per rotation of the worm (see my post of 26 September 2011). Figure 7: To show the rack. The micrometer mechanism is of conventional design (Figure 8). The lower end of the index arm carries a post for the bearing of a swing-arm chassis to which the plain parallel bearing of the micrometer worm shaft are attached. A large leaf spring (radial preload spring) holds the worm in contact with the rack and a simple cam allows the worm to be swung in the plane of the frame out of contact with the rack against the spring pressure. This allows the index arm to be moved rapidly into position before releasing the catch to re-engage the worm for final adjustment. A smaller leaf spring (axial preload spring) bears on the end of the worm shaft to take up any axial play in the bearings. Also shown in the figure are the two keepers, which prevent the index arm from lifting away from the front of the frame. Since one rotation of the worm with its attached micrometer drum advances the reading through 2 degrees, the drum is divided 0 to 60 minutes twice with subdivision to minutes (Figure 9). 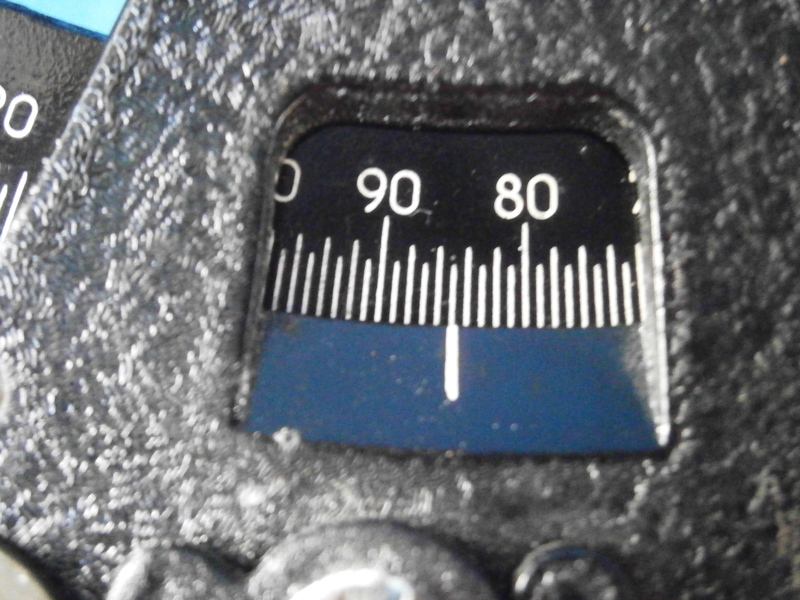 The main scale on the limb and the micrometer drum are divided to single degrees and minutes respectively, with alternate tick marks being long (Figure 10). At first sight, this gives the impression that half-degrees and minutes are being shown and it might have been easier to read had the normal practice been followed of making the 5 tick mark longer than the others. Figure 9: Micrometer drum divisions. Figure 10: Main scale close-up view. The shades are unremarkable except that there are only two index shades instead of the more usual three or four and one horizon shade instead of two or three. No provision is made to prevent the index shades rotating together, but as there are only two of them this does not pose much of a problem. The two shades together give adequate reduction for viewing full sun and the single horizon shade also gives adequate reduction of glare beneath the sun. The mirrors and their brackets are conventional. The horizon mirror is fully silvered, but there is adequate overlap of the direct and reflected images when viewed through the 4 x 25 mm Galilean telescope; though the field of view is somewhat restricted, I found no difficulty in finding the sun, though with star sights the story might be very different. I have not been able to discover for whom this instrument was intended. Its small size and simplicity suggests it might have been aimed at yachtsmen, for whom storage space may be at a premium. It may also have found the occasional sale among surveyors and explorers. A merchant marine officer is unlikely to have wished to be seen using anything other than a full-sized instrument. It came to me without a case. Monsieur Hervé Le Bot has kindly provided me with a photograph of the case interior, which is shown in Figure 11. Unusually, the sextant is stowed in its case upright, in a socket which accepts the hexagonal handle and which has cheeks to prevent it from rotating.